Here’s my take on a pate de fruit and ganache layered chocolate. Pâtes de fruit are fruit jellies, a sophisticated and delectable French confection made with real fruit. They have an intense fruit flavour and are a lot like a set jam, making them worlds away from the more commonplace fruit-flavoured jellies (which, let’s face it, are just sugar shapes with artificial flavours and colours). Happily pâtes de fruit are also vegetarian. 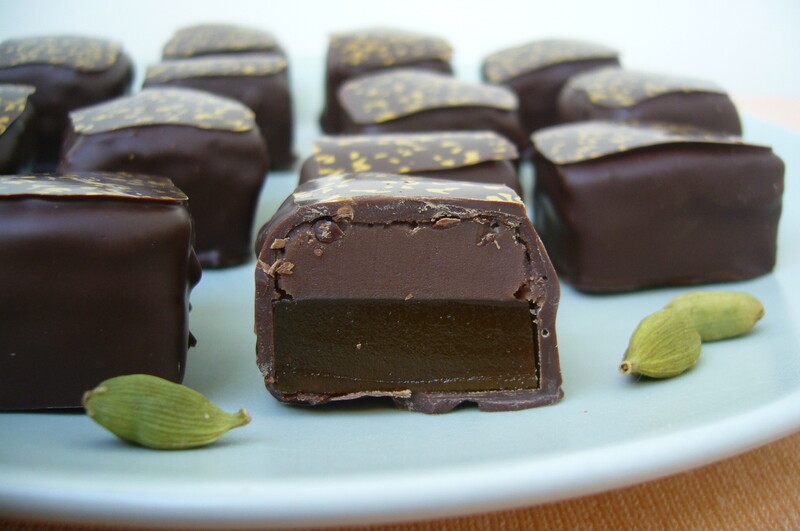 The quince sweets I made are an example of such a treat. 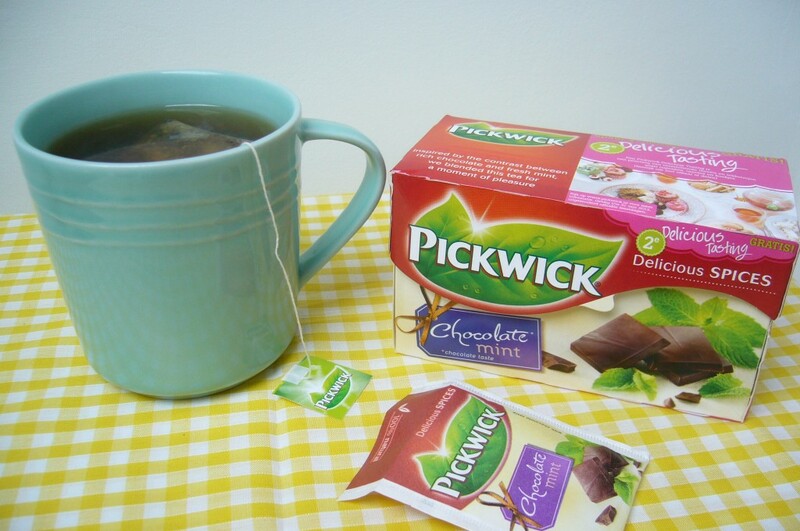 I was craving a taste of the exotic when I came up with the flavours to go in this chocolate – I think it was during that very cold week recently after a short spell of warmer weather, and inspired by a mango lassi I enjoyed not long ago. 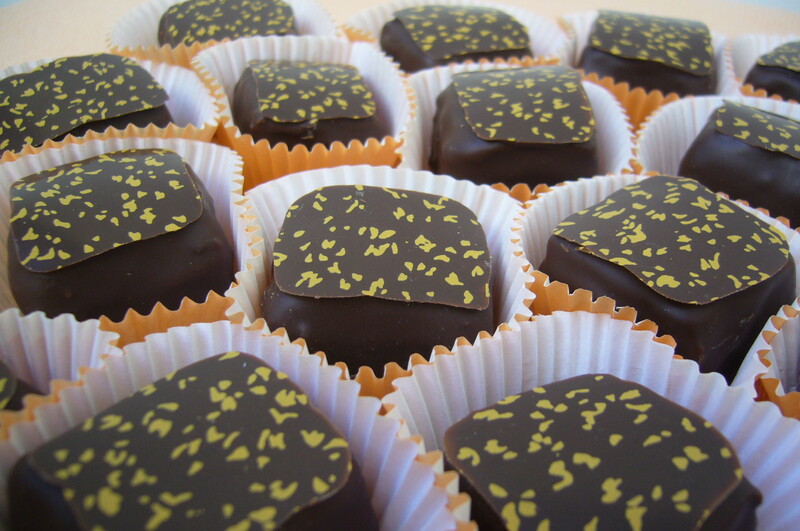 So, here it is – mango pate de fruit, topped with cardamom ganache, enrobed in a dark milky chocolate and decorated with orange-gold flecks. I was worried that the cardamom wouldn’t be able to stand up to the strong mango flavour, but it actually packed a punch. Yummy. I’ll definitely be making this again, though I might try each on its own next time for single flavours. Still, these two make perfect partners. The different textures work really well together; soft cardamom ganache atop slightly chewy mango. Mm-mmm – a taste of the tropics. 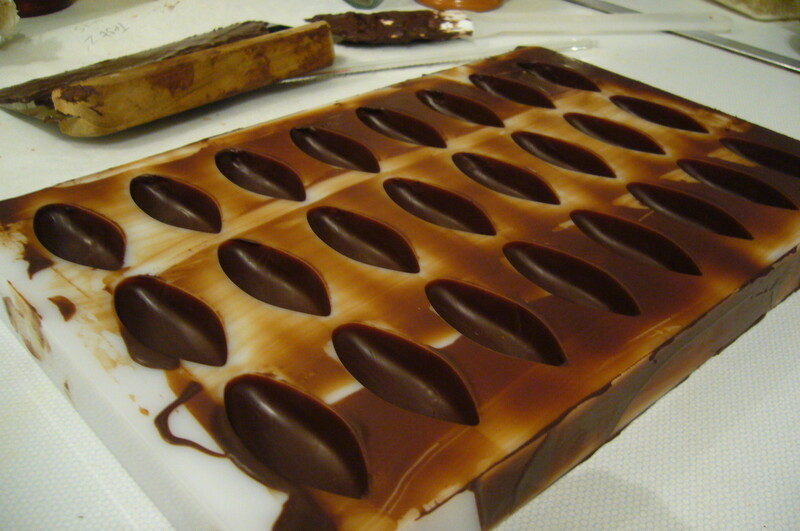 So, yesterday I tried my hand at the second method of tempering (crystallising the cocoa butter within chocolate). 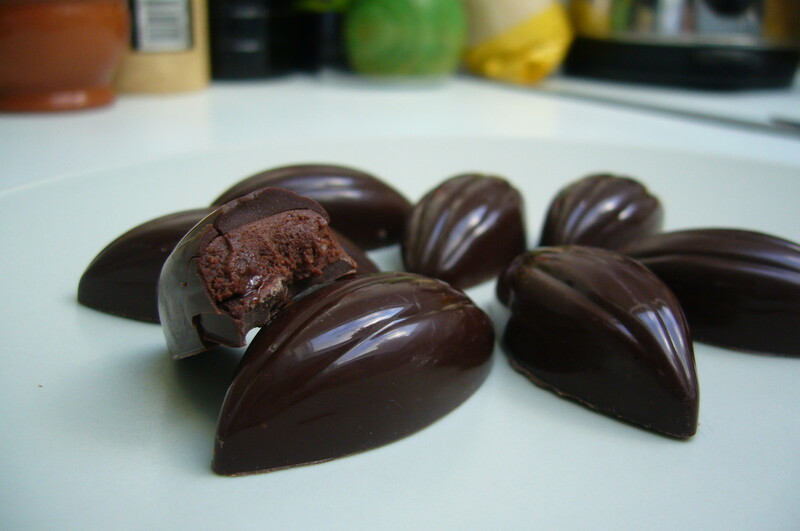 This one is called the seeding method, and involves stirring small pieces of already tempered chocolate into melted chocolate to cool it and to introduce the right kind of crystals. Again, temperature matters here. 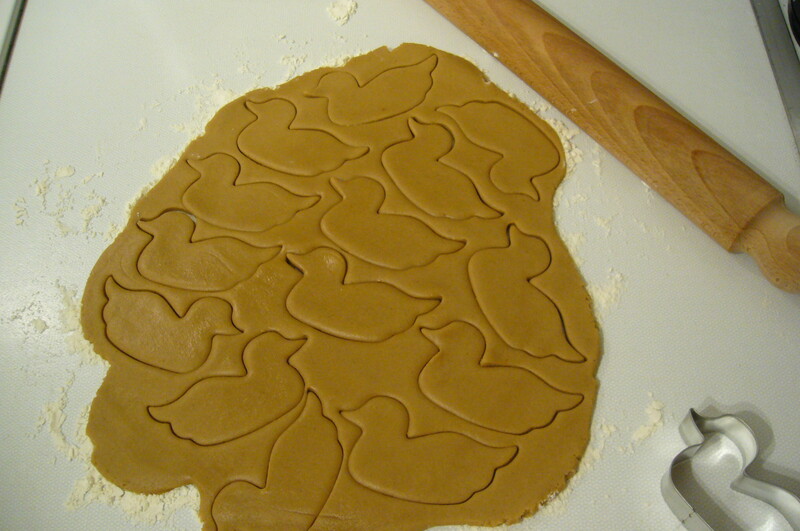 This method was much less messy than using the marble slab but not nearly as satisfying. 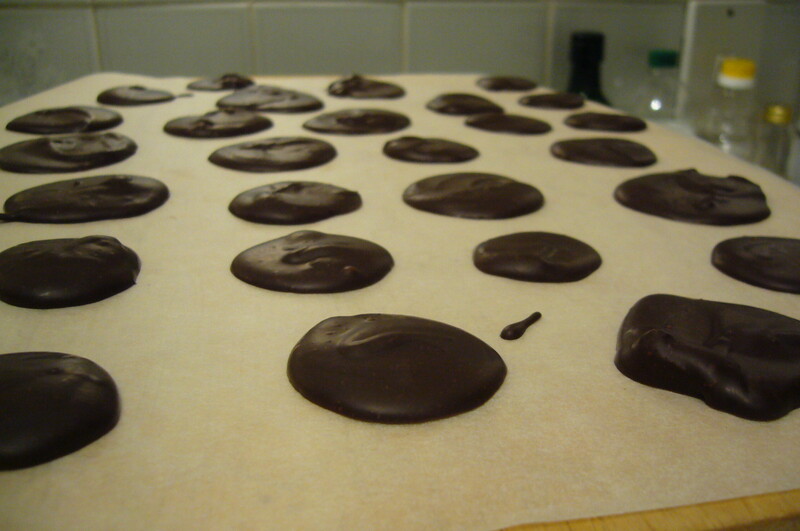 Happily, I got this method down pat too, and used the tempered chocolate to make rose and jasmine truffles. They looked pretty for about half an hour, until the chocolate started cracking a little and the ganache filling began to ooze out in places. I did my reading and learned that this was because the ganache was too cold when I dipped it, meaning that the chocolate cooled and contracted too fast. Oops. A useful lesson! 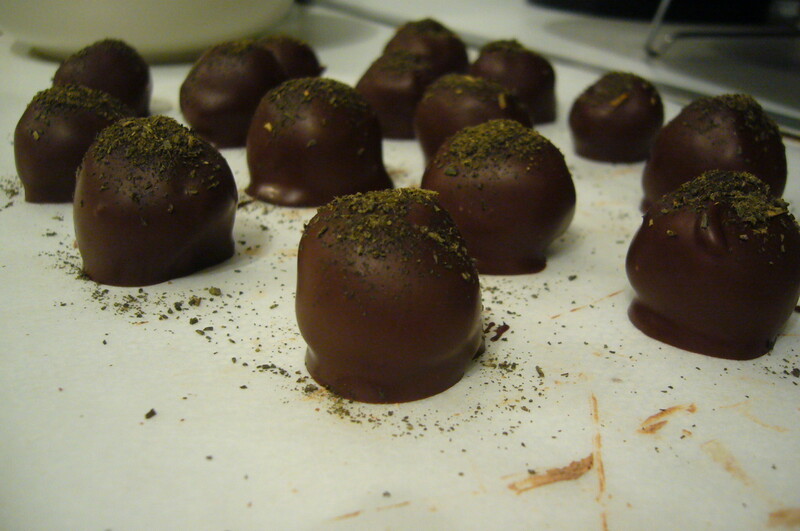 I also made cumin and coriander discs (courtesy of Paul A Young’s recipe from Adventures with Chocolate). These are very robust and are not for the faint-hearted! Luckily I like strong flavours. This recipe is taken from Vegetarian by Alice Hart and adapted slightly. It’s got a subtle sweetness and certain delicacy to it. It feels light and it’s a great colour. Roast the garlic cloves for around half an hour in their skins, and when done, pop them out of the skin. They should be golden, soft and sticky. Place the carrots in a saucepan with just enough water to cover them. Add the olive oil and a pinch of salt. Bring to the boil and simmer for around 10 minutes until the carrots are tender. Meanwhile, pinch the skins off all the chick peas and discard (this process takes a few minutes, but trust me, it’s worth it for a much smoother consistency). 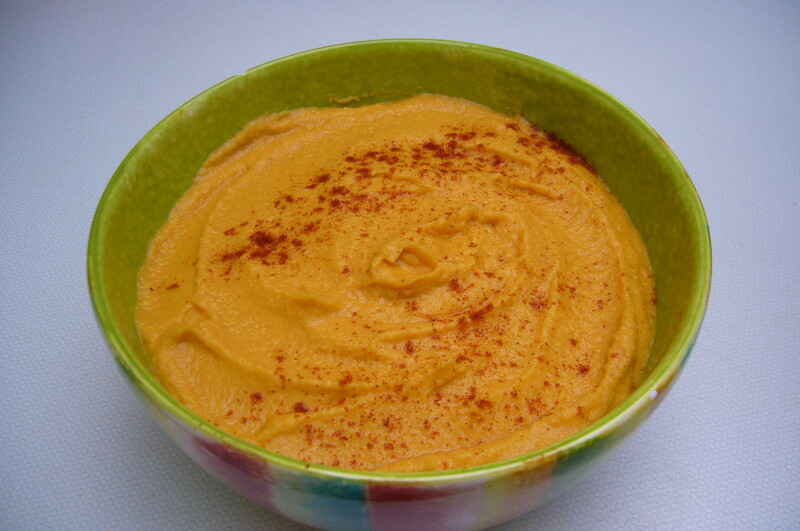 Pour the carrots and their water into a blender with all the other ingredients and whizz it up until smooth. Sprinkle a little smoked paprika over the top before serving.